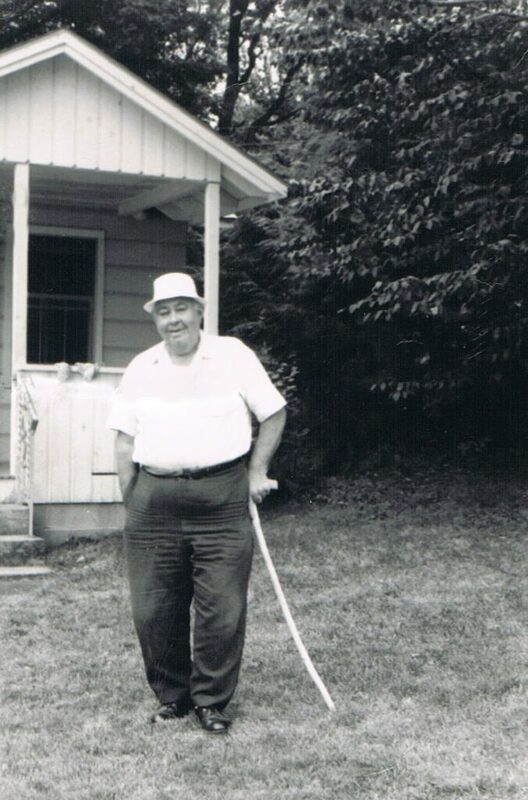 I think I was 9 that summer my mother drove us to visit my New York City grandparents at a Sullivan County Catskills bungalow colony. My mother was a good driver, but I’m not so sure about her map reading ability. My father always drove to summer vacations and visits to the relatives in the Bronx, but this time, my father couldn’t get away from his insurance sales job to go with us. Somewhere en route, my mother got a little lost, but she spotted a horse trailer and decided to follow it, surmising it would guide us to Sullivan County because it must be going to the Monticello race track. It couldn’t possibly be going anywhere else. Predictably—I wouldn’t be telling the story if it had a happy ending—the horse trailer was destined for parts unknown, we were lost for many miles, and the horse trailer story entered Frankel family lore forever. Otherwise I thought I remembered nothing about that trip. 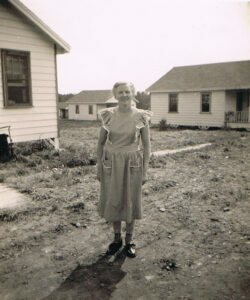 My mental picture is probably not mine but Kodak’s, preserved by these two snaps of my grandparents at the bungalows. That is, until I started doing research for this trip and all kinds of things came back to me with the help of the internet. Eventually, I recovered the name of the town—South Fallsburg—and the nearby Lake Kiamesha. A cousin remembered Morning Star Cottages, an English translation of the owner’s surname, Morgenstern, and so I found it in the Catskills Institute database. But it is long gone. The Jewish Alps or The Borscht Belt they called the Catskills, as thousands of Jews fled to “the mountains” during 1950s and 1960s summers. My grandparents hardly had two nickels to rub together (as my mother would say), but somehow they went. The cost was probably about $400 for the whole summer. Nostalgia may be a common sign of aging, but it makes for great expeditions. On a bright, but wintry March 17, my brother Ethan, his wife Tracy and I went looking for our past in the Catskills. Near South Fallsburg we found this derelict colony and entered the yard as far away from the No Trespassing sign as we could find a break in the chain-link fence. This place was probably a little fancier than the Morning Star. It is now a deer yard. My brother gave me the antler he found. Later that day, as the only guests at the Sullivan County Historical Society museum, we learned a version of the latest chapter of Judaism in the Catskills from the docent, a 60 year old ex-hippie who spent several years meditating through the New York winter in an unheated bungalow, but is now a county employee and qualified museum professional. New York Jews largely deserted the Catskills beginning in the ‘70s, and many hotels and colonies were abandoned. But, our docent said, “The ultra-orthodox Jews came back some years ago during an economic crash. Property values dropped and they bought up whole towns.” She reported as indisputable fact a complete separation between the new wave of bungalow denizens and local businesses. 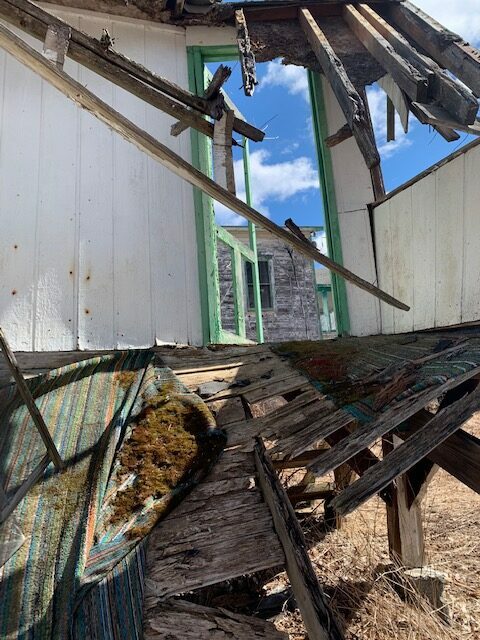 “They come up here for two months in the summer and the rest of the time, the towns—Woodbourne for example—are completely boarded up. They bring everything with them when they come, even an ambulance,” she said. A drive around the area shows clearly how many properties have become new seasonal Jewish developments, fenced off in the winter, with their signage in Hebrew or Yiddish, and their self-contained places of recreation, education and worship. But you also see another industry: health care, spas and New Age treatment centers that have sprung up in the economy vacated by the old summer trade. And everywhere you see dilapidated housing stock and depressed towns that look very much like the areas farther upstate across the lake from Burlington. Clearly the area’s economic troubles long pre-dated the arrival of the Hasidim. I stayed in an Airbnb on a farm in Swan Lake (really) just up the road from Liberty. Farmer Paul enthusiastically showed me a farmyard alive with more than 100 sheep, goats, pigs, ducks, turkey, chickens, cows and a horse. He and his wife bought the property in a 2006 foreclosure auction and struggled to make it work. Then they discovered a new income stream: summer farm tours for the Hasidic communities. 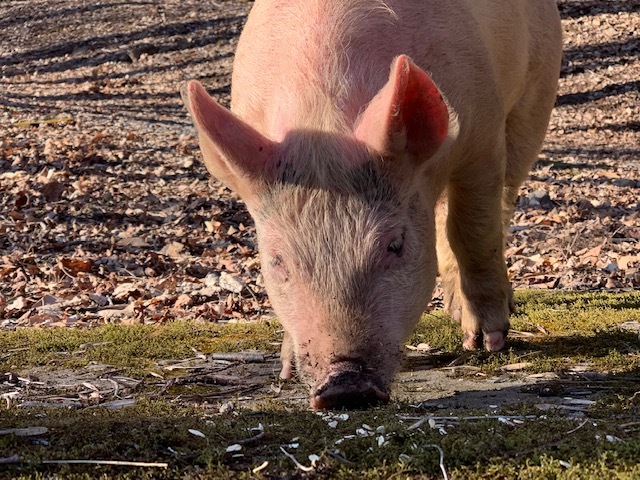 Sometimes Farmer Paul trailers a few animals out to visit the developments and sometimes the summer people come to him. The racetrack has added a casino. Someone is making money building all those new fenced communities under construction around Liberty and South Fallsburg. It isn’t my grandmother’s Jewish Alps, but the more things change, the more they stay the same. The old divisions and the new identity politics are just as toxic as ever. 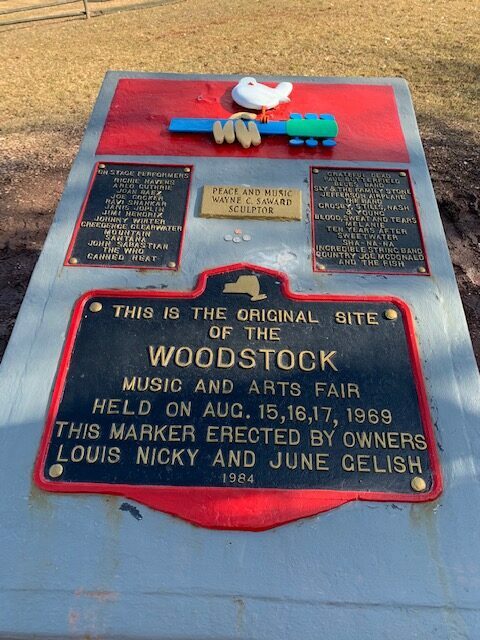 How funny: droves of tourists visit Woodstock, NY, thinking it hosted the 1969 festival, which was actually 50 miles away in Bethel, not even in Ulster County, but in Sullivan County, so we paid a visit to the shrine, even though we were on Lake Winnipesaukee when history went down. We were there in spirit. The fear of “different people with strange appearance” that you learned of in the Catskills reminds me of the experience of Mormons in the 1800’s as they kept moving further and further west to avoid the situations. Also the case of fear toward devotees of the Bhagwan in Rajneeshpuram in Oregon (a complex story which does have some evil elements). We were talking about the Oregon story during the day in the Catskills. I want to read more about it. Recently a developer announced plans to buy up a town in southern Vermont and create a religious community. The backlash was fierce. Deena, I just discovered your blog. So interesting and so well-written. I look forward to reading more!